JEFFERSON CITY, Mo. 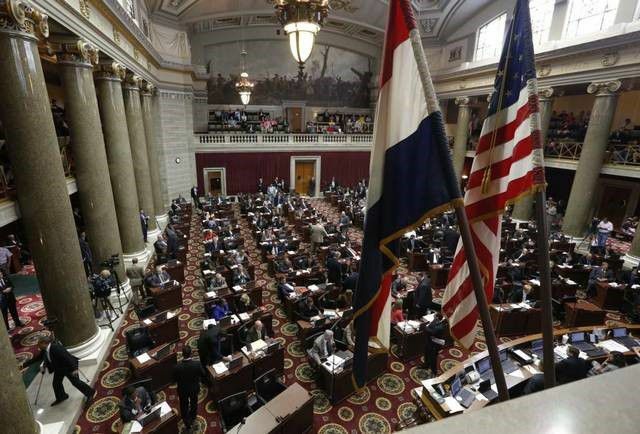 (AP) — Missouri state senators early Wednesday gave initial approval to a measure that opponents have criticized as making it more difficult to sue for discrimination in the state and voted down protections for LGBT people. Democrats railed against the bill on discrimination lawsuits for hours Tuesday before hammering out a compromise after midnight. It received initial approval in a voice vote. Republicans and pro-business backers say it's now too easy to sue for discrimination in the state, but opponents argue the proposed change would allow discrimination to go unpunished. "It's unfortunate that the Missouri Senate has taken the very first step in moving forward with Jim Crow legislation," Missouri NAACP President Rod Chapel told reporters Wednesday. He added that the measure would allow people who "perpetrate or have violated the civil rights of others to remain free of any penalty for their conduct."